1939 Redlining map of Los Angeles. Green areas were the most desirable, followed by blue, yellow, and finally, red. Three mega-Chinese communities in the United States—Los Angeles, San Francisco, and New York—are each home to more than 600,000 Chinese Americans. But L.A. stands out in a peculiar way. Unlike San Francisco and New York, where authentic Chinese food has been fairly well geographically dispersed for a number of years, the Los Angeles area until quite recently concentrated its authentic Chinese food in just a handful of places, especially the San Gabriel Valley. Why? What makes the distribution of authentic Chinese restaurants in Los Angeles so different than its counterparts? It’s a complex question. The sheer geographic spread of the L.A. metropolitan area makes it inherently different than the compact cities of San Francisco and New York. Still, barely three years ago, I wrote about how L.A.’s entire Westside was a wasteland for Chinese food. Though this is quickly turning around, why do many Los Angeles neighborhoods continue to be devoid of quality Chinese food? A major factor: housing discrimination. Though legally prohibited since the late 1940s, the legacy of housing discrimination affected choices for Chinese Americans into the 1970s and residually affects the location of Chinese food to this day. With few exceptions, authentic Chinese restaurants only operate where there is a critical mass of nearby Chinese residents. Thus, an area without many Chinese residents does not offer very good Chinese food. Because of the history that I’ll explain here, many Los Angeles neighborhoods still fit into this category. Of course, overt racial discrimination in housing has been a fact of life throughout the United States for decades. Los Angeles, however, magnified its effect. As a 20th century boomtown, the City of Angels rapidly expanded from a half million residents in 1920 to 1.2 million just a decade later. These Angelino transplants fought hard to keep their new neighborhoods white. 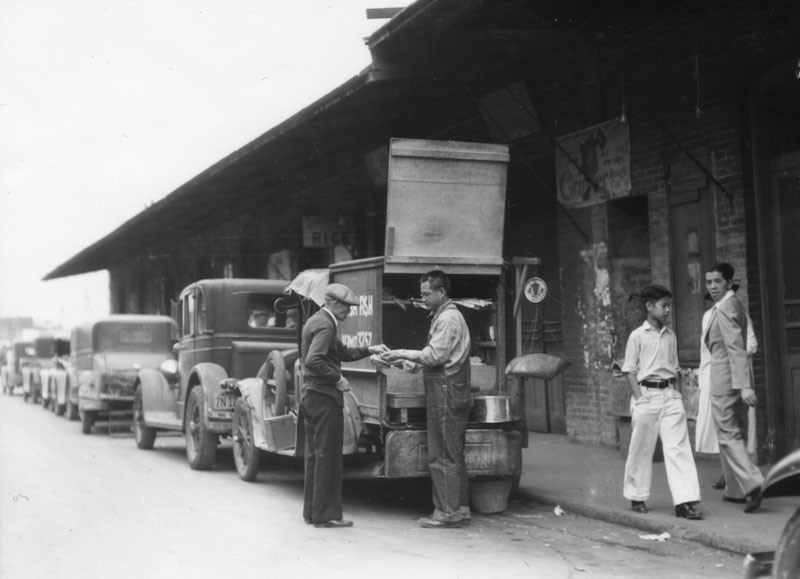 A vendor sells fish from a truck in the original Chinatown, circa 1934. At the same time, a new legal tool was pioneered to help them. The racial restrictive covenant, a provision inserted into residential real estate deeds, prohibited the occupancy of the deeded property by minorities, aside from live-in domestic help. Racial restrictive covenants emerged in reaction to The Great Migration, the post-World War I migration of blacks from the Jim Crow South into the industrial east and Midwest. But it was here in L.A. that these covenants were put to best use. They provided white homeowners a “respectable” alternative to race riots and mob violence in real estate conflicts while achieving the same ends. One example of a racial restrictive covenant, written into the deed of former California State Assembly member and city councilman Hector De La Torre’s home in South Gate. In 1948’s Shelley vs. Kraemer, the Supreme Court outlawed racial restrictive covenants. However, the Court did not fully invalidate the covenants and certainly did not retroactively remove offending provisions from any existing deeds. (Imagine my reaction upon buying my first house, which was actually built after 1948, and finding a racial restrictive covenant in my deed.) A second Supreme Court ruling in 1953 had to weigh in again. Racial restrictive covenants were only one in a series of legal methods to keep white neighborhoods white. In 1939, the New Deal established the Home Owner’s Loan Corporation to help Americans who had defaulted on their mortgages in the midst of the Great Depression. However, to convince banks that the investments were safe, the practice of “redlining” denied funds to certain neighborhoods with a “subversive racial element,” almost ensuring the economic decline of these areas for the rest of the century. 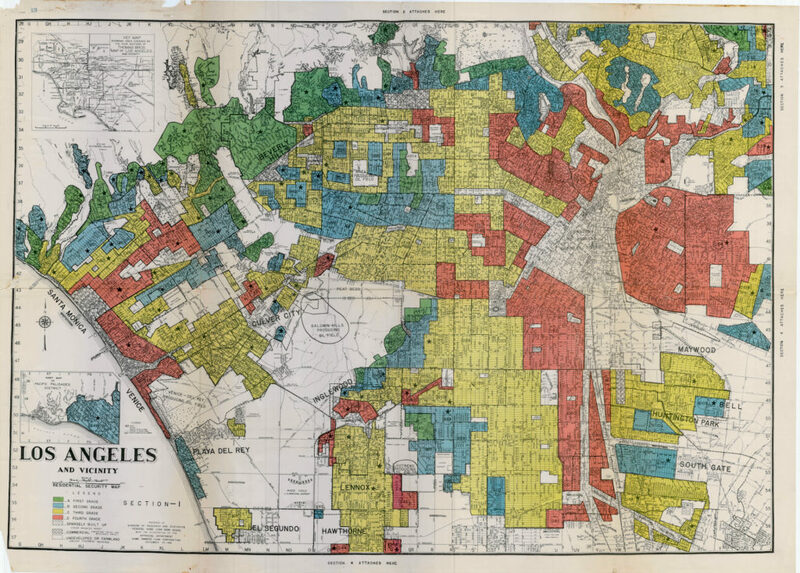 Even when rendered illegal, housing discrimination continued in Los Angeles. In the early 1960s, when my family was looking to buy a new home, the real estate broker took my dad aside. He told him not to bother to make an offer on the house we just visited because the homeowners on that block had banded together and pledged not to sell to a minority buyer. Under the professional ethical rules for Realtors at that time, brokers were prohibited to assist the racial integration of a neighborhood, since property values would be damaged. “Blockbusting,” the practice of introducing minority homeowners into previously all-white neighborhoods, thus sparking “white flight” and depressing housing prices, was a predatory practice to create speculation profit from prejudice-driven market instability. Meanwhile, the construction of the freeway system made it easier for whites to relocate to the suburbs, contributing further to segregation. The 1968 Fair Housing Act ostensibly outlawed blockbusting, but it continued. In 1964, California voters overwhelmingly approved the controversial Proposition 14, a referendum to nullify the Rumford Fair Housing Act of 1963. The Rumford Act allowed a state commission to intervene on behalf of potential tenants and homebuyers when a manager or homeowner denied a sale or rental due to race. 70% of L.A. County voted in favor of Prop 14. Though the California Supreme Court overturned Prop 14, and the United States Supreme Court upheld the state’s decision in 1967, it did little to integrate L.A.
Against this backdrop, it is no surprise that Chinese Angelinos faced a structurally restricted choice of housing opportunities. Official laws and unofficial practices forced the Chinese community to concentrate in the minority neighborhoods of south and east Los Angeles. Only 20,000 Chinese lived in Los Angeles in 1960 compared to 600,000 today. And since today’s Chinese have no outright restrictions on where they can live, you might think that there would be no continuing effect on where they settle, and consequently where authentic Chinese food would follow. But in fact, echoes of the past linger. In the 1960s, in the midst of blockbusting and Prop 14, Chinese and other Asians gained a toehold in the San Gabriel Valley, leading to the creation of a giant quasi-Chinatown. Because the vast majority of today’s Chinese community wants to be near the center of this action, Chinese remain underrepresented in so many other parts of town. The best historical examples of communities with little authentic Chinese food are the Westside and the San Fernando Valley, two semi-contiguous areas within the city limits. Home to two million of the four million residents of the city of Los Angeles itself, the Westside and the San Fernando Valley had no authentic Chinese food prior to the 1990s. Even five years ago, each probably had only a handful of authentic Chinese restaurants. Westsiders grew accustomed to driving an hour to 90 minutes to the San Gabriel Valley if they wanted dim sum, soup dumplings, or other Chinese dishes, and even longer during rush hours. As I’ve noted, the Westside has seen a 180° turn in its Chinese food fortunes in the last few years, in large part due to Mainland Chinese students attending UCLA, as well as other demographic changes. But the San Fernando Valley remains devoid of Chinese food. Before I started at UCLA in 1965, I told people that I hadn’t been to the Westside more than five times in my life (which was probably a slight exaggeration) and had only visited the San Fernando Valley five times or less (not an exaggeration at all). I suspect that most other Chinese of my era felt a similar geographic orientation. So to my fellow Angelinos, you live in the city with the country’s best Chinese food. But since you probably can’t reach any of that food without a long and exhausting drive, look to history, and possibly even the deed to your home, to explain the injustice of it all.